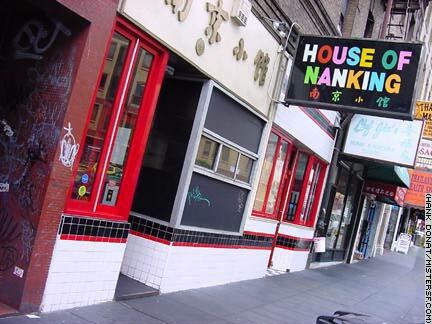 House of Nanking, 919 Kearny Street Six year-old Michael Sosnick is seen here at his initiation as a San Franciscan, his first visit to House of Nanking. The Chinese restaurant at 919 Kearny Street is the hole in the wall that got "discovered." That explains the queue that runs down the block from here seven days a week. Michael is sampling the Nanking Beef, a specialty at this, his father's favorite restaurant. The service is notoriously brusque, and the drink selection isn't great, but who cares? With food this good, the tiny joint near Columbus Tower is an institution and bound to stay that way as long as San Franciscans line up, drop in, and open wide.